I stayed in Lucerne over night at my parents place. 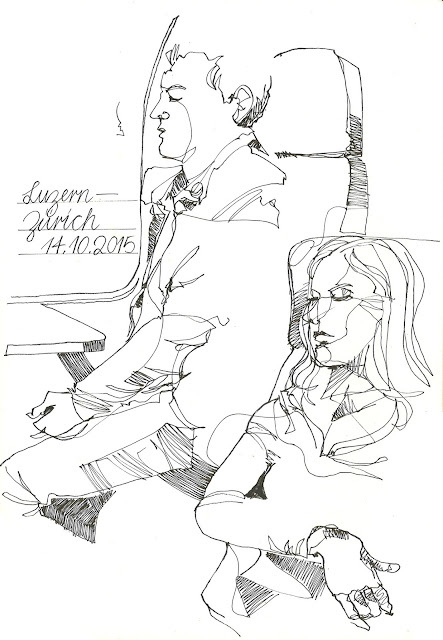 So this morning I found myself in a train that was very packed: a lot of people travelling from Lucern to Zurich to work. I felt so happy that for me this early morning experience was an exception. Spending an hour like this twice a day (aller er retour) would not be my thing. Or would it? Maybe I 'd practice much more sketching people.... Most of these guys traveling to work in trains seem to sleep for an extra half of an hour. Perfect to draw: not moving, not embarrassing as they don't even notice. I took this train from Lucern to Zurich several years ago... it wasn't my thing definitely! Unfortnately I wasn't able to draw, once I was always sleepy like these guys! Hat was von Science-Fiction-Illustrationen aus den Sechzigern. Klassisch klasse! Früh aufstehen kann sich lohnen! Flotter Start in den Tag! Mit-Pendler beim pendeln zeichnen, einer für mich fast tägliche Tätigkeit. Wunderschöne Linienführung. Die ist cool! @ Boris: Genau das hat was! so viele coole skizzen in letzter zeit! merci für's Feedback, die 60er waren ja durchaus experimentierfreudig (in allen Belangen) muss mich auch mal achten!